Surface, a group exhibit featuring 10 of my paintings from my series, "How Many Miles to Babylon," and 9 of my small gestural pieces, opened last night at Space Gallery, 400 Santa Fe Drive, Denver. The show is up until November 1 of this year, please come on by. The other fine artists exhibiting are Jo Marks Aardsma, Tonia Bonnell, Sophia Dixon Dillo, Carlene Francis, Susan M. Gibbons, Nancy Koenigsberg, Diane McGregor, and Sharon Swidler. The exhibit is hosted by gallerist Michael Burnett and curated by Jo Marks Aardsma. How Many Miles to Babylon No. 5, c. 2014, Nancy Charak artist, 18"x24", oil, oil wash, polyester thread, copper roofing nails on unprimed cotton canvas. Space Gallery in Denver, "Surface" for Friday, September 26 through November 1, 2014. Opening reception is that Friday the 26th, at 400 Santa Fe Drive, Denver, 80204, phone 720/904-1088. Please come on by. 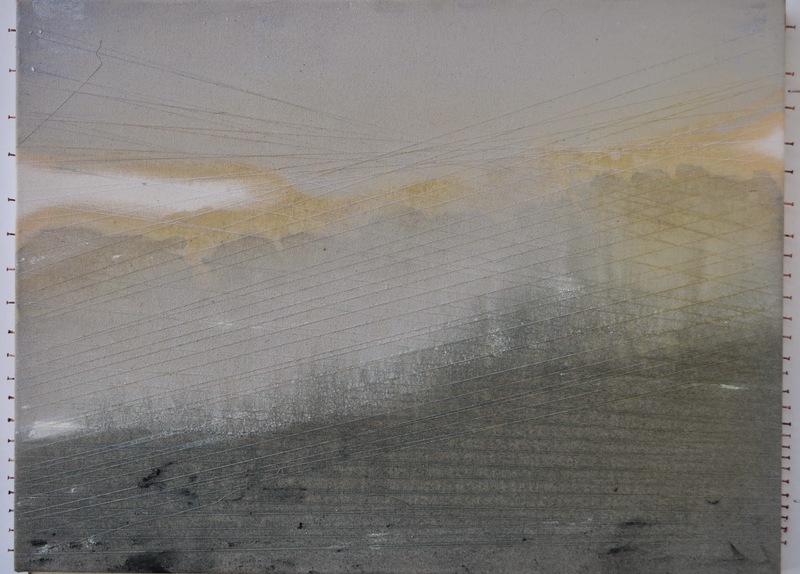 Conrad Wilde Gallery has scheduled some of my new watercolors in a group exhibit, "Geologic Time," opening reception February 7, 2015 closes February 28. The gallery is reopening in a new location at 101 W. 6th Street, downtown Tucson. Next year, "Black" is scheduled for November 2015, at Space Gallery as well. I will post updates as the schedules are firmed up with opening and closing dates. My work is on display and for sale at The Nevica Project, under the auspices of Jayson Lawfer, at 3717 N. Ravenswood Unit 115W, Chicago, IL 60613, (406) 360-0164. Take a look, he has a nice stable of artists that I'm tickled to be listed with. ROUNDER STUDIO has moved. I have pulled an Agnes Martin, decamping to the southwest, Tucson. Now engaged in the delightful exercise of making art work for these and other upcoming shows. Just because Wegman, so there. More of watching people look at art, a repost of this video. Winged Victory, Samothrace, Louvre. Heading back to Denver for the Opening of Surface at Space Gallery, 400 Santa Fe St., from 6 to 9pm. Please come on by. A little bit about the Blue Bear, "I See What You Mean," and the artist Lawrence Argent. . .and the nose was at the corner of 14th and Arapahoe, the Denver Center for the Performing Arts. Short video, Grant Wood, American Gothic, Art Institute of Chicago, I like to watch people looking at paintings. I feel as if I am eavesdropping. Space Gallery: This show interests itself in the “non-objective”: art that is not representational, that contains no recognizable figures or objects, art that has no intentional derivation from any concrete matter. 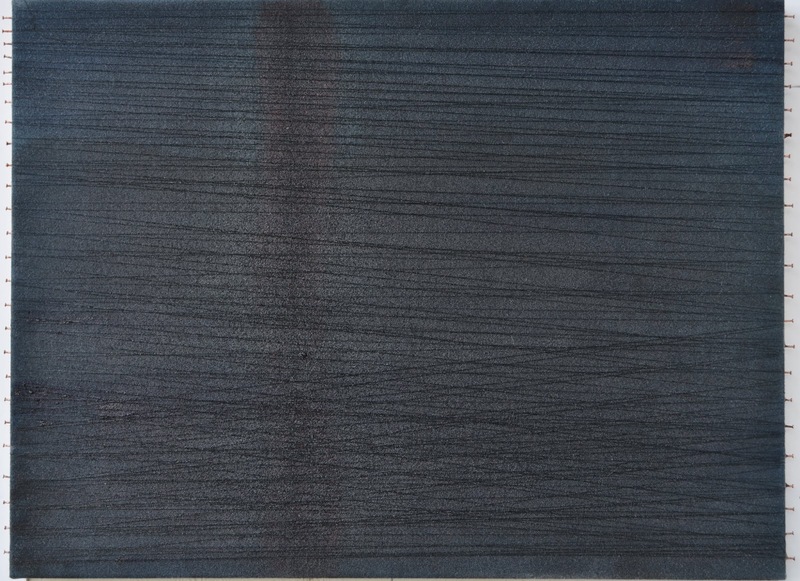 The work for this show was selected because each artist uses the surface as a crucial element beyond a vehicle on which to apply a medium….either revealing what is behind/under the surface or concealing/altering/manipulating the surface itself and in a palette of white, black, gray, or neutral.